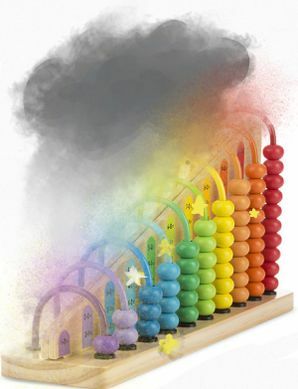 The abracadabacus is a bold artifact forged by great mathemagicians to do their odd thaumathurgical work. In their cultures, math is the language of the arcane arts. Rather than incanting long and meaningless phrases, like "Alakazam!" or other such nonsense, these magic users create precise and perfect mathematical expressions to refine and manipulate the flow of ethereal energy. With the manipulation of carefully carved beads, these masters of black arts, both math and magic, can control the perform miraculous feats and strange illusions. All becomes possible and all becomes illuminated with the clash of mystical and mathecal. How did this rare and powerful artifact end up in Godville? There is another strange tale in which one conclave of experimental mathemagicians seek knowledge beyond possibility, a reknowned theoretical math wizard is kidnaped, the largest ever abracadabacus is built and 1 is ultimately divided by 0. Following this magimathic breakthrough and the brutal murder of the laws of physics of the division of one by zero, the origin universe of abracadabacuses collapses into a singularity of pure magic. Though casualties exceeded 100%, a strange anomaly only possible because of math already becoming nonexistent with the division of zero, there was one escape. The enourmously large magical abacus slipped through a crack in the wall of the universe and escaped into the ether between realms. Here, it tripped on an inter dimensional rock, and fell into Godville. This harsh transition into a world that to it was completely alien, caused a fracture in it’s essence. Milliseconds later, it would fracture into millions of tiny abacuses that would be sprayed across Godville in what was quite a spectacular show. Later on, monsters would pick up these artifacts and add them to their collections of loot. They would then go on to be killed by heroes or heroines who would steal all of their stuff. And that is how an abracadabacus May have ended up in your champions inventory. This page was last edited on 7 August 2018, at 09:57.